Specialist Lifting Solutions offer a Lift and Shift heavy lifting service. We provide a specialist handling and manual handling service including stair climbing and a machine moving skates. Home or in the office, we can move items up to 5000kg with accuracy and ease. All our employees are fully trained and experienced to handle both heavy and/or awkward items. What is a Skates or Skoots moving system? 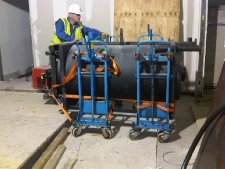 Skoots/skates are portable moving systems which use hydraulics to enable loads up to five tonnes to be lifted off the floor and onto casters. The Skoots moving systems can then manoeuvre in any direction with ease, regardless of the size or shape of the item. Skoots are able manoeuvre heavy and awkward items across various terrains without any slipping or sliding as the item is securely strapped to the system. Accurate positioning of an item is also made simple with the Skoots moving systems by utilising four swivelling casters, which can then be lowered with precision using the hydraulic jacks. Specialist Lifting Solutions are recognised and approved by Stanley Handling, the main Uk distributor of the Powermate powered stair climber and stair walkers. Please take a look at our heavy lifting page, there you will find a small selection of items that we are able to move with our stair climber / stair walkers. The pictures below show an example of how Specialist Lifting Solutions played a vital role in the relocation of two 1 tonne boilers at a shopping park in Reading for CDS Service Group LTD.
CDS were completely satisfied with the knowledge that Specialist Lifting Solutions had all the relevant Health & Safety paperwork in place, and that all regulations were complied with at all times. The pictures below display two central heating boilers made from 6mm solid steel, each weighing in excess of 1200kgs that were relocated from the 1st floor to the ground level. The pictures also show the different types of terrain we can cross in order to relocate various different items. Lifting and manoeuvring made simple and safe with our Skoots moving systems, stair climbers & stair walkers. Specialist Lifting Solutions Lift And Shift can move items up to 700 kilos up or down stairs with our Powermate lifting equipment. Health and Safety in the work place is all our responsibility.Specialist Lifting Solutions the risk potential of a job by a providing risk assessment method statement. With our Stairclimber equipment, even the largest of loads can be a one man operation. Specialist Lifting Solutions Lift and Shift are fully insured to lift and relocate your items wherever you need them to be. All our employees at Specialist Lifting Solutions are fully trained and experienced to handle all logistical situations.